Sh2-119, or Sharpless 119, is a large complex of emission nebulosity in Cygnus constellation, about 2 degrees east of the North American Nebula. 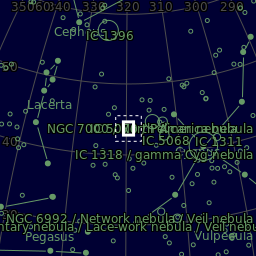 It is located just around 68 Cygni, a quite bright star of magnitude 5. The nebula was catalogued by astronomer S. Sharpless in his famous "Catalogue of HII Regions", published in 1959. Sharpless described it as a large (have an apparent diameter of about 2 degrees) and "bright" nebula. The nebula is crossed by several dark dust lanes and globules, especially on the southern part.